At some point in your design career, someone is eventually going to walk up and say, “Hey you know that revision B (or some other revision) you started the other day in Vault, well we decided it’s no longer needed”. As the person is walking away, you probably will have a few chosen words to say about this decision but now you’re faced with getting the Vault information back to the Revision A. If you manage Vault 2016 lifecycles through your files, the rollback workflow does the job and in most cases there are no issues in doing so. However, on the Item side this is not the case for Vault 2016. This workflow will not purge the related file like the file side does and you are left with the incorrect file version being associated to your Item’s revision. First let me demonstrate what happens… At this point I’m assuming your Vault is properly configured and when an Item is released, the related file is locked down as well. If this is not the case for your configuration, please keep in mind the images contained within, may not appear exactly as you’re seeing. Also in the interest of keeping this article short I have elected to only show screen shots where I felt it was necessary. 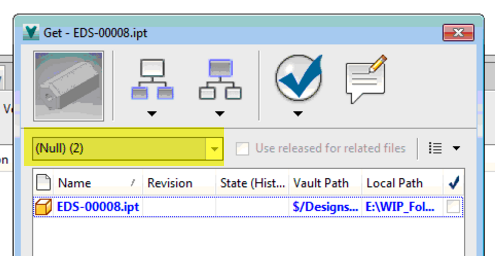 An Inventor part file was created and checked into Vault (version 1). This same file was checked out again and changes were made to it. The was checked back in (version 2) and am Item was assigned to it. The Item (and related file) was then released (Revision A) and the file is locked down as well. The Item’s lifecycle was changed to work-in-progress and the revision on the Item was bumped to Revision B. 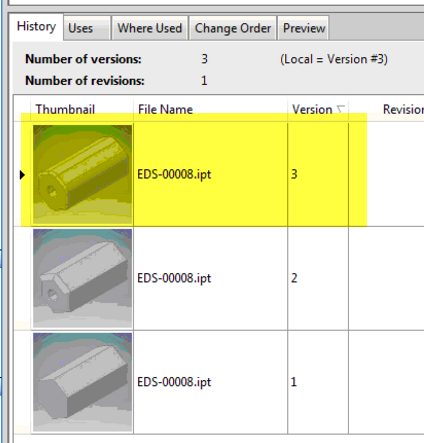 The Inventor part file was checked out again and changes were made to meet the requirements of Revision B. The part was checked back in (version 3) and the Item was updated as well. Now at this point, we receive word that Revision B is no longer needed and we need to get back to Revision A of our design. 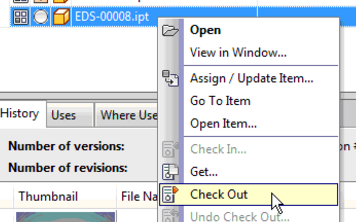 We locate and select the Item, pick the tools pull down menu and select roll back the lifecycle state. When this occurs, we receive the message confirming our operation. We will then select Yes (to continue), now the Item lifecycle state is rolled back to the released (Revision A) state and the version of the file is set to 2 (for our example). At this point everything is correct…. However, when we look at the file itself, version 3 is still being listed as the latest file version. In addition you will also notice the file is locked down based on my Vault configuration. Remember, Version 3 of the file is based on the changes we were making for Revision B. It is no longer needed and if I start an assembly and I require this file, I will be placing a version in my assembly that shouldn’t exist at this point. So how do we correct this? So let’s recreate the steps again using a different part. We are now at the point where the Item lifecycle has been roll backed and all the information is correctly presented at the Item level. But like before the file is shown at version 3 and locked down. Before continuing on please make sure the related file is not currently opened in Inventor (or the related application). 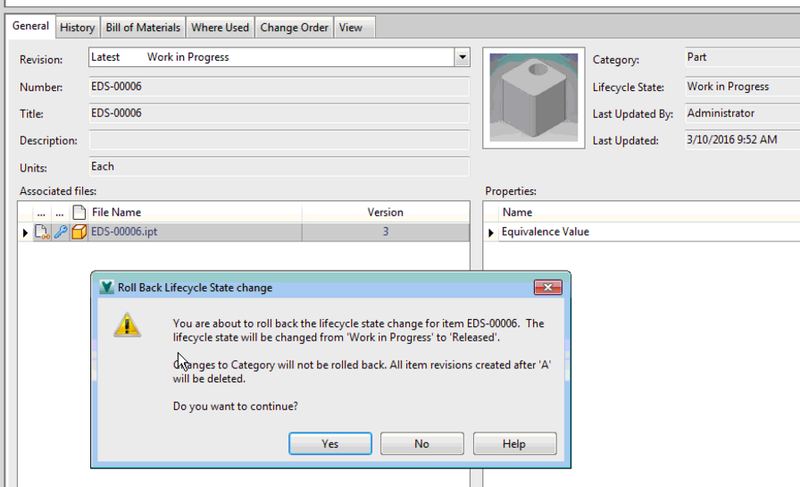 Locate the Item and change its lifecycle state to Quick Change. Locate the file in Vault and check it out using the Vault client. Then under the history tab of the file, locate the correct version (in our case version 2) that is associated to Revision A (or the revision you need). Right mouse click on that version and select Get. Confirm that the “Get” operation is pulling down the correct file version and complete this operation. Select Yes to confirm you want to over-write our checked out file. 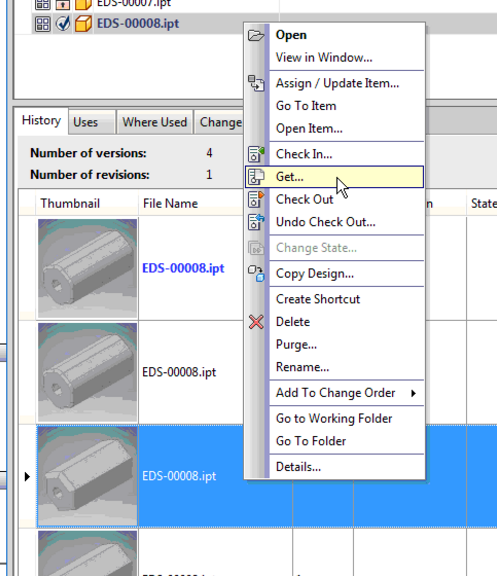 Now switch over to Inventor (or the required application) and open your file using the normal Inventor open command. At this point you should now be viewing what the file looked like at version 2 (as per our example). Save and check the file back into Vault. Return to the Vault client, do a refresh and then update the Item. Finally change the lifecycle state of the Item back to release and now everything is in sync with Revision A of the design except the file version will be different at this point. Hopefully the information I have provided here has helped you understand what’s happening when an Item lifecycle state is roll backed in Vault 2016. In previous versions of Vault an option was provided in the rollback message that would perform these steps (if checked) for you. 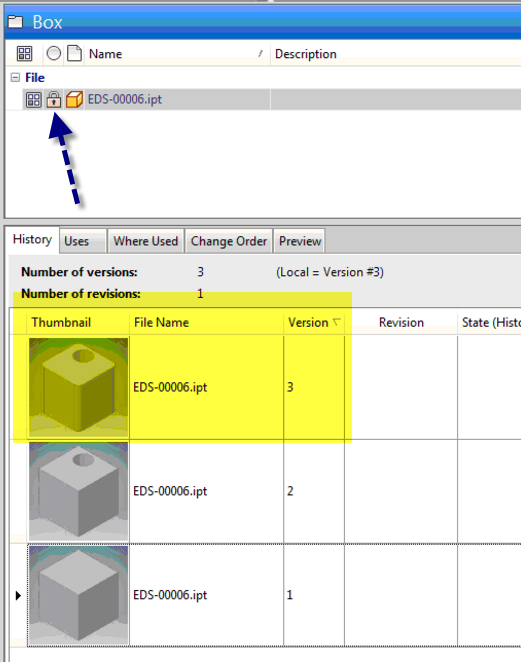 It is my understanding from the Autodesk Vault Support team this change was made in 2016 to sync both the file and Item lifecycle rollback process as a single interface and not to have them as separate entities like they were in previous versions of vault. As you can see the Item lifecycle state rollback process for 2016 forces the user to perform some additional steps to complete the process. In closing I’ve only demonstrated this process to you using a single Inventor part file. You must thoroughly investigate and determine the correct course of action when dealing with an entire Inventor model structure and/or an AutoCAD with Xrefs.